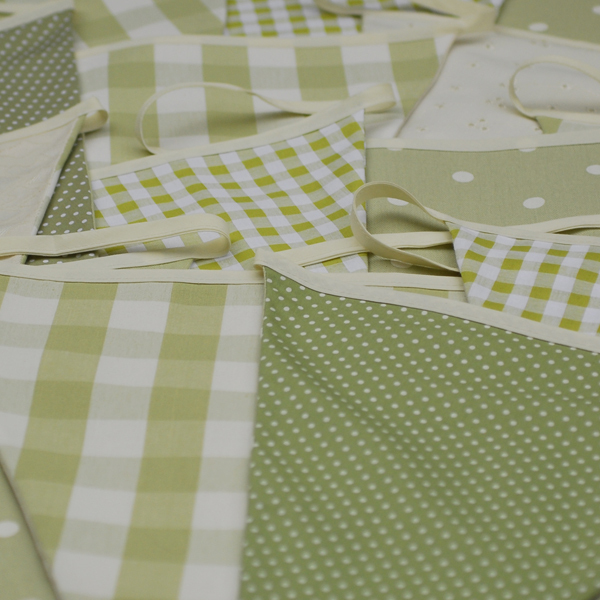 We have many styles of bunting for you to choose from. Each design is named after the first bride who requested it! Please contact Hilary for the latest designs and to discuss your requirements. 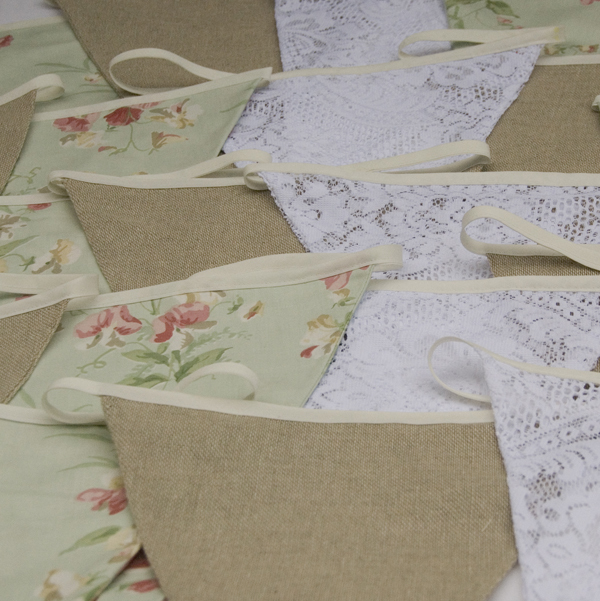 Our lovely ‘Charlotte’ bunting is a mix of a vintage floral fabric, rustic hessian and delicate lace. Absolutely on-trend for today’s vintage style inspired brides. ‘Lucy’ bunting is a lovely mix of dotty and spotty soft sage greens and checks of similar hues with additional beautiful cream broderie anglaise. Mix and match with our Deonne bunting for a style that blends well with flowers of all seasons. ‘Kelly’ bunting is both chic and glamorous with an Art Deco elegance. 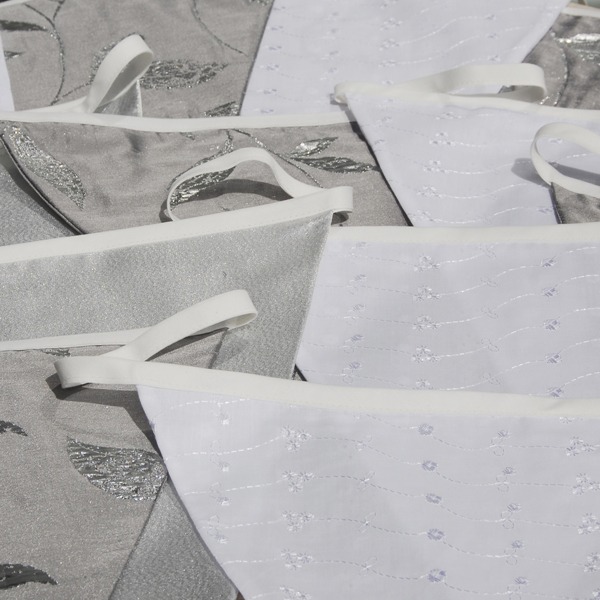 Silver leaves on a silver background alternating with crisp white broderie anglaise flags. Absolutely perfect for weddings, christenings and, of course, anniversaries. 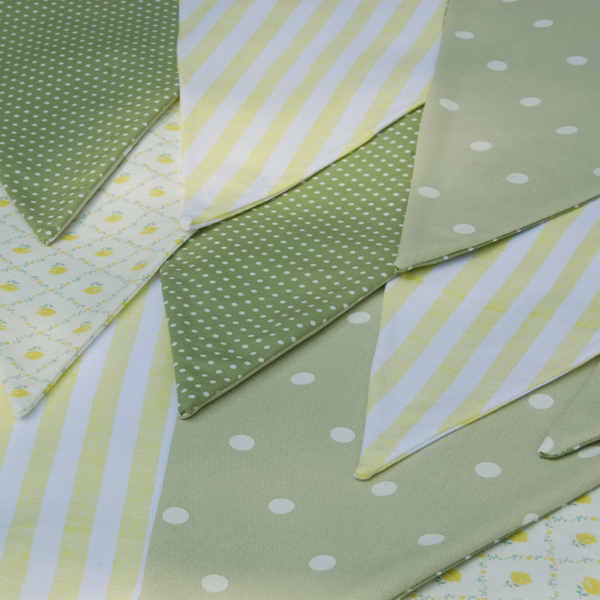 ‘Deonne’ bunting is dotty and spotty in soft sage greens with checks of similar hues along with vintage Laura Ashley yellow trellis and and delicious zesty lemon stripes! ‘Lucy’ is a perfect match, with this combo creating the impression of foliage and splashes of daffodils and sunflower yellow! 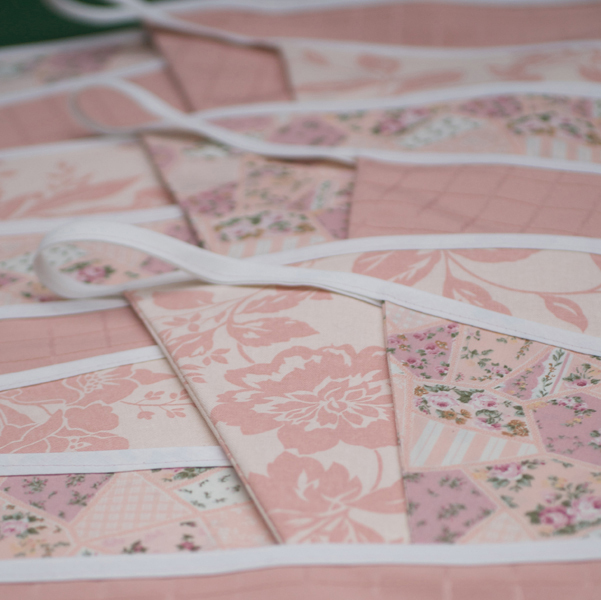 ‘Michelle’ bunting is a fun combination of sugary tones with pink checks, stripey greens and floral blues. The eye-catching candy tones particularly seem to pick up colours in bridesmaid’s dresses! Just Peachy! This lovely style is a mix of beautiful peaches and pale apricot. It has been used effectively in a serene chapel, blending with the lovely oak beams high up in a barn and to decorate “party central” in a marquee. 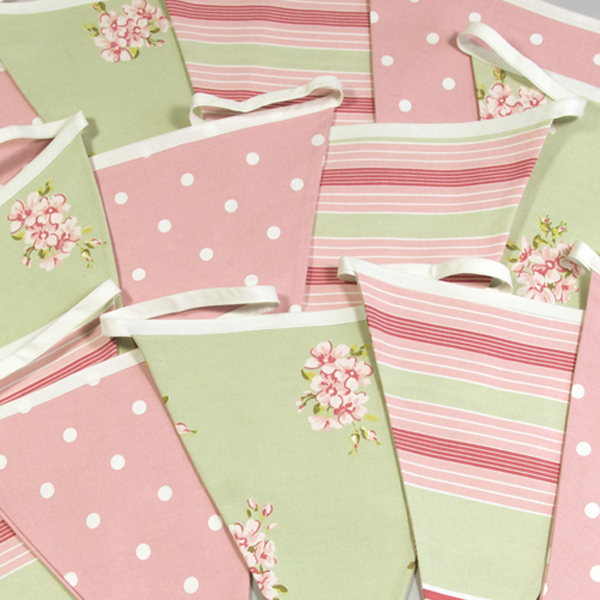 A beautiful colourful palette of greens and pinks in flowery, stripey and spotty patterns. A very popular choice and ideal for a lovely spring or summer event. A 1950s sweety look! A wonderful selection of spring and summery hues of blue and white including a vintage Laura Ashley yellow sweet pea fabric. 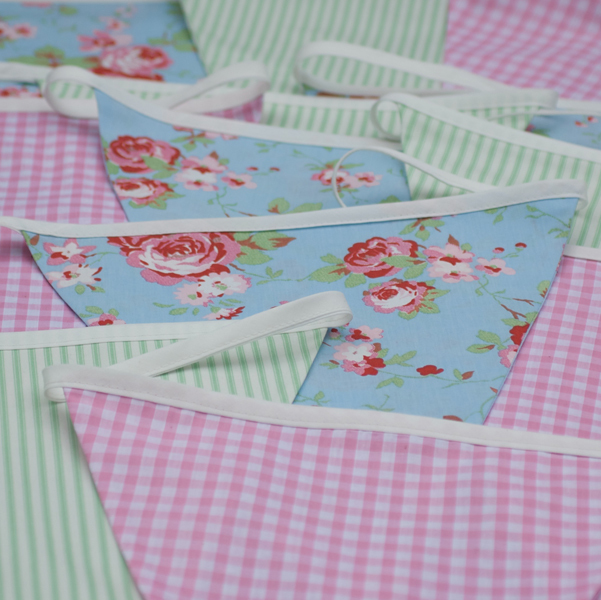 An ideal bunting to bring crisp summery blue skies to your garden party or wedding. Summertime is here again! 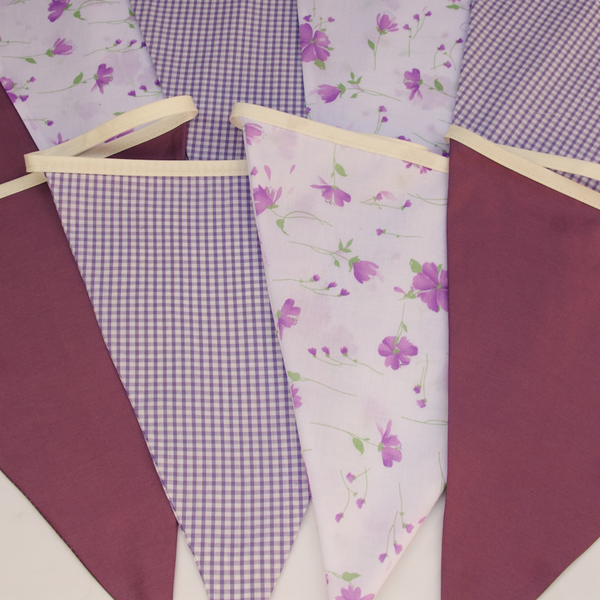 This lovely bunting in shades of lilac, lavender and pale violet has floral, plain, spotty and checked flags. All tones found in the quintessential cottage garden. Extravagant silks and satins were used to create this sumptuous combination of ivory, caramel and rich chocolate brown flags. These glamorous colours have been used for autumn and winter weddings with twinkling fairy lights and candlelight! These colours range in aqua tones from teal and jade through to peacock green. A contemporary twist to period shades. 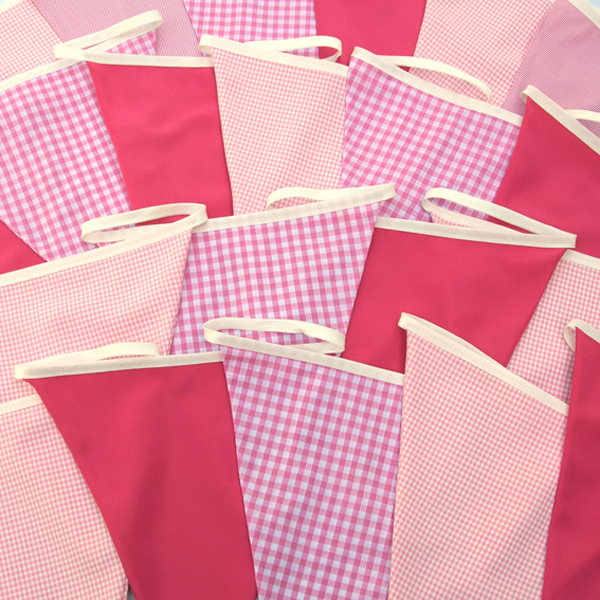 This is a 30 metre set of bunting and has been matched with the cerise of “Katherine” for a Caribbean fiesta theme. Tifaine is a multi coloured bunting for all sorts of occasions from barn dances to family parties. A jolly collection of reds, greens, yellow and blue. Checks, floral, spot and abstract patterns! A new style for summer in sizzling shades of cerise and fuchsia, tones which seem to create a festival style – whatever the weather. Our autumnal style bunting is a mix of rich burnt umber colours Silky tartans, mini flowers and dotty fabrics all in pumpkin and dark orange. If you are planning an indian summer wedding this will add a beautiful seasonal touch.